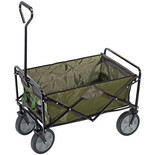 This Draper Garden Caddy With Wheels has a lightweight design to maximise manoeuvrability. 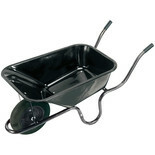 The 40kg capacity makes it extremely useful and versatile in a variety of garden tasks. 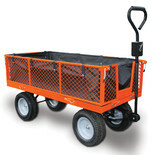 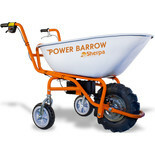 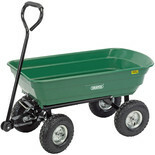 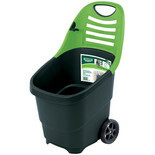 We have a number of garden trolleys able to fulfil your every gardening waste dispensing need. 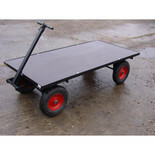 Our garden trolleys are ideal for manoeuvring waste, tools and equipment around in commercial or domestic surroundings. 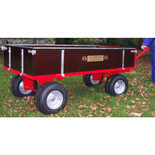 The drop sides – a standard feature, make it easier to load and unload your goods/waste with minimum fuss, making it a more efficient and time saving purchase. 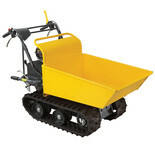 We stock garden trolleys with large, sturdy pneumatic tyres which are designed to navigate any landscape with maximum ease. 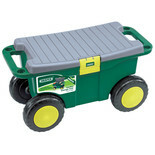 You can either guide it by hand or attach the trolley to your mower or tractor, making it easy to utilize in conjunction with heavy-duty equipment whilst on the move. 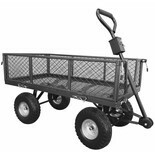 Also twisting and turning around your garden or workspace needn’t be a hassle if you use one of our garden trolleys with a flexible front axle - making steering a straightforward task. 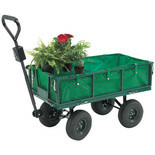 We’re confident our range of garden trolleys can be a wise investment for you for the years to come.